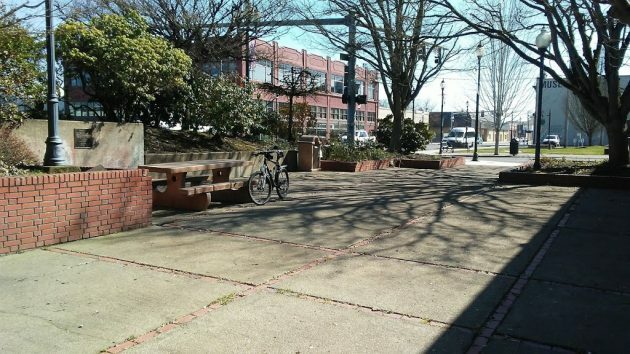 The patch of Albany urban space known as Burkhart Square on the afternoon of March 17. 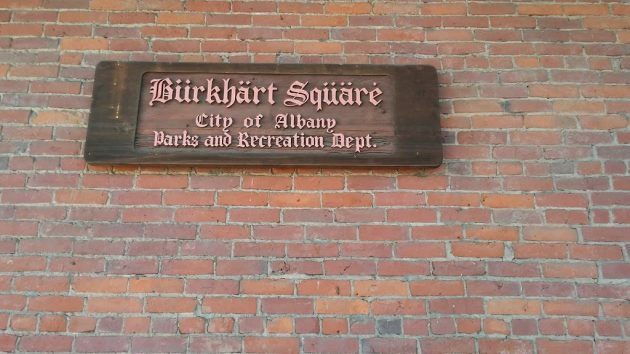 Prompted by a reader’s comment about Albany’s Burkhart Square, I stopped there recently to take a look. One thing that made me want to know more was the plaque containing the dedication. 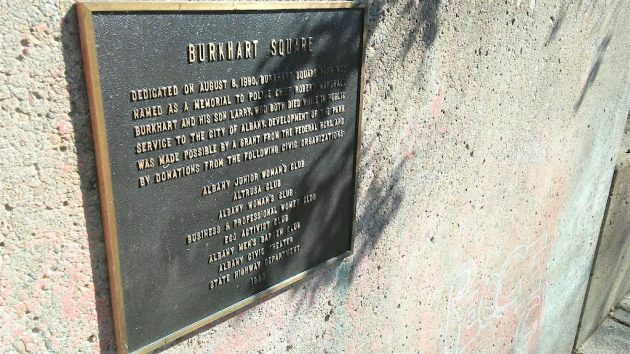 From the inscription we learn that the space was dedicated in 1980 and named as a memorial to Police Chief Robert Marshall Burkhart and his son Larry, “who both died while in public service to the city of Albany.” That’s all it says about them. In 1980 I was in my third year at the Democrat-Herald. But I remember nothing about the origin of this public space, or about the men for whom it was named. To learn more, I turned once again to the Albany Regional Museum, a block from Burkhart Square at Lyon Street and Second Avenue. There, staff member Erica Broad, helpful as always, came up with a clipping from the Democrat-Herald of March 24, 1970. It reported that Police Chief Robert M. Burkhart had died early that day at Albany General Hospital. He was 46 years old, and what killed him was an apparent heart attack. He had been chief of the Albany police for about eight years, starting in 1962. The files had nothing about Larry, but the museum’s Bill Maddy found a website that gave his birth year as 1951 and the date of his death as Dec. 1, 1978. That took me to the newspaper microfilm files at the main branch of the Albany Public Library. Library Director Ed Gallagher was kind enough to show me how to work the film reader, which was a few steps above the antediluvian machine we used at the paper back in the day. It was a short obit. It said Larry Burkhart had died the day before at age 27. It didn’t give the cause of death. But it did add the fact that Larry had served in the army from 1970 to ’73, that he was a Vietnam veteran, that he was a son of the late Chief Burkhart, and that he was survived by his wife and mother. It also explained the phrase “while in public service to the city” that appears on the plaque: At the time of his death, Larry was employed as an equipment operator with the Albany Parks and Recreation Department. One other thing: The plaque credited a grant from the “federal HCRS.” Never heard of that agency, but Wikipedia has: The Heritage Conservation and Recreation Service was created in 1978 during the Carter administration to identify and protect cultural and other resources. In 1981, under Reagan, it was abolished and absorbed in the National Park Service. Wall plaques are not the place for explanations. So if you want answers and context, you sometimes have to hunt them down. 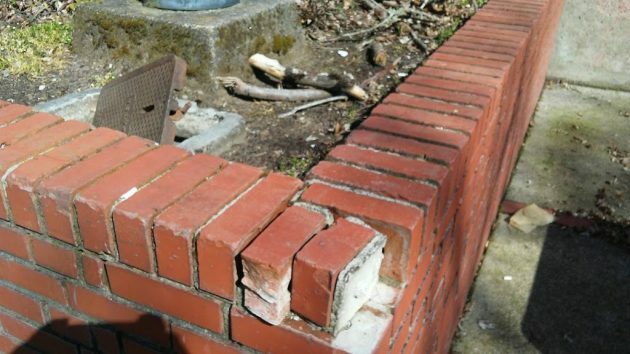 Somebody must have bumped into this corner in the Burkhart Square brickwork. What are those dots doing on the vowels of Burkhart Square? The German alphabet consists of 26 characters plus 3 umlauts: ä, ö and ü. The two dots above the letters do NOT indicate an accentuation or emphasis of the syllable (as for instance accent-bearing letters in Spanish or French). Umlauts are used as independent characters in the German language. The be more specific, umlauts represent the letter e. For example ü could also be written as ue. The way they’ve been added to the sign is nonsensical. I’m curious though, why would the city choose a german font and german “embellishments”? Is there some connection? I was privileged to work for Chief Burkhart having been hired in 1960 by his predecessor Ray Maddy. Burkhart was a firm but fair chief to work for. He could have you on the carpet then take you to coffee. I believe the museum has a photo of him directing traffic at the foot of the Ellsworth Street bridge during a busy time. Don’t recall if the occasion was on a Saturday after an OSU football game, Veterans Day, or Timber Carnival Parade or an accident but he could be expected to show up at the most unexpected times. He was born and raised in the Albany area and loved the city and its citizens. His loss was a shock and surprise to those of us who worked for and respected him. While the park’s history is quite interesting, the most revealing aspect is the author’s take on the decline of local Newspapers, fueled in part perhaps by the devolution of service/quality as evidenced by the demise of a local obituary editor at the Democrat Herald as well as most other papers. Not to quibble, but wasn’t the HCRS the “Conservation” not the “Conversation” agency? As a former resident of Albany (back in the 60’s & early 70’s) I find the quixotic range of topics in this blog to be fascinating and highly interesting. Keep up the good work Hasso and one day you will be recognized as one of those community treasures. Of course. Thanks for quibbling. The fix has been made. I enjoy this little square during intermission from our Albany Civic Theatre. It makes for a nice stretch and enjoyment of the surroundings; a nice spot created at a busy intersect! There was a lady named Elsie Burkhart who was a secretary at the Childrens Farm Home about 1950 or a little earlier. I wonder is she was a relative. The square was originally going to be named Regina Square after Regina Frager who owned with her husband Fragers Furniture. I belonged to Albany Junior Womens Club that was raising money to build it. After Larry died, also of a heart attack, the name was changed with everyone agreeing to the change after the Parks Dept. suggested it.